The United Travel Service may be my favourite 60s group never to have made an album. This is an injustice because over the four sides on these two 45s songwriter Ben Hoff certainly laid down killer folkadelic tunes. The high quality on offer makes me certain they had enough in their repertoire to make a classic psychedelic LP. All four cuts were produced by Rick Keefer who also worked with The New Tweedy Brothers and Sound Vendor. The United Travel Service 45 you got is most definately rated very highly by Expo67. Their other 45 is possibly even better (if that's possible..)pure raga rock...folk rock with a psych edge or whatever way you wanna describe it. (who "was there and in the band for the duration"), "the band consisted of Ben Hoff,guitar and vocals, John Reeves 12 string guitar, Ray Doern,bass, and Dale Sweetland, drums. The band originated in Portland,OR and did several concerts with The Doors (yes, the real Doors) on the West Coast.". I was the drummer in the UTS and core member, my name is Dale Sweetland. The other core members were Ben Hoff, John Reeves.. We used a few different bass players. Ray Doern was the primary. Jim Roberts played bass on Gypsy Eyes, and Ben played bass on Echo of You. Jim Roberts was a guitar player from Minnesota who we met at OSU, but we needed a bass player at the time. John Reeves and I met in 1967 and that was the beginning of the band. He was from San Jose and used to see all the SF rock bands around the area, so they were actually a big influence on our sound. I don't remember the actual end, but it must have been around 69, or 70 as I left to go on the road in 71 with a band out of Portland. At the same time I was with UTS I played with Sunday Morning , Madrid and the Counts, and filled in part time for Aesop and the Fables. 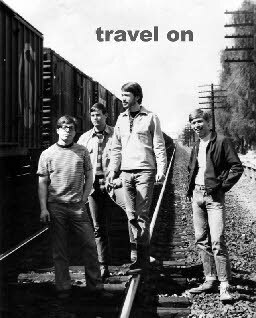 This was a band that had several national releases back in the 60’s mainly consisting of protest psychedelic music and long jams, we did college concerts up and down the west coast,the band consisted of Ben Hoff,guitar and vocals, John Reeves 12 string guitar, Ray Doern,bass, and Dale Sweetland, drums. The band originated in Portland, OR, and did several concerts on the West Coast, including one with The Doors. Q: How did you first get interested in music? I played clarinet in Junior High School circa 1959-60 and then mostly enjoyed the growing SF sound of the early-mid sixties. We hit the Fillmore and Avalon on most weekends during high school and several close friends played guitar and formed a band which I followed closely. I did not play guitar then . . . that would wait until college. I was quite influenced by the Byrds, and in particular Roger McGuin's 12-string, but was a big fan of Jeff Airplane, the Grateful Dead, Moby Grape, Steve Miller, Big Brother, Quicksilver, and all of the great bands playing the SF scene. Q: Was The United Travel Service your first band? If not, which band was? How long was it together? The United Travel Service was my first band. We formed in the fall of 1966, the beginning of my Sophomore year at Oregon State University. We were together through college until I entered active duty with the Air Force in July 1969. I think the guys played some after my departure, which may be why some names that have been attached to the band are unfamiliar to me. Once Dale bought into the idea of forming a band with me and trying to bring a SF sound into the NW, we were on our way. I had a Hoyer acoustical-electric 12-string but no amp to start. I immediately purchased a Vox Berkeley II amp, on time, for $10/month payments! Dale had to be nuts to want to do this! This was my band but it would have never happened without Dale and I will forever be grateful to him for having the faith to move forward with the idea. Actually, the first name of the band was to be The Virgin Forest, fitting for Oregon and being a start-up, but that was only momentary. Our first gig was in a lounge in Corvallis and we may have played as the Virgin Forest, but if that was the case, it was the only time. Ben Hoff had a conflict that night and we played just with Dale on Drums, me on 12-string and another guy on some keyboards - I can't remember his name. It was a miserable start but we got through it. Q: If you haven't already done so, please list the names of each member of The United Travel Service, as well as the instruments each played. Also playing with us for periods were Ray Doern and Steve Bennett. There may have been one or two others but I really can't recall. Q: How would you describe the band's sound? What bands influenced you? I was trying to bring some of the SF sound to the area, so the acid rock of the day was evident in our jams and Jim Richards could copy just about anything. He was particularly good at covering folks like John Cippolina of Quicksilver. Aside from that, the 12-string gave us a somewhat unique sound. Ben Hoff brought his incredible songwriting into the picture and we had a rather special sound to offer. All the bands mentioned above influenced us but we found our own niche with Ben's music and that is what we will be remembered for. I would say we were about 40% own material and 60% cover for our live performances. Q: What was the Portland rock and roll scene like at the time? In the beginning, it was all Sonics and Kingsmen. Other than that, you had Gary Lewis and the Playboys and the like. I recall the first time I heard the Jefferson Airplane (Somebody to Love) on the radio up there . . . the DJ said they should fly back home. I was committed to changing that attitude. By the time we started recording and playing regularly, things had quickly changed. Quicksilver headed a card which we were also on at the Portland Masonic Temple sometime in '68 I believe. We met them in a small pawn shop by coincidence in Portland. I was a huge fan of Gary Duncan and John Cippolina and was thrilled to have met them. The UTS name was close to a plagiarism to be honest. We also opened for the Doors at OSU in and around the same time, so the music in the NW was changing rapidly. Of course, we also played on a ticket with the Brothers Four at OSU's Gill Coliseum so some of the folk stuff remained a fixture. Q: Where did the band typically play (schools, parties, etc.)? We played a lot of frat/sorority dances as well as a few in the OSU Memorial Union building. I recall playing in Eugene at a place I think was called the Yellow Balloon. If memory serves me, the Vanilla Fudge was heading that card and it was a thrill to be part of it. We played the gig in Portland's Masonic Temple. We played in Monmouth at the Western Oregon College. We played at some High Schools in the area as well. After getting established we spent much of our weekends recording in Portland and Vancouver. We were a start-up group for Producer Rick Keefer (Engineer Ken Bass if I remember the name correctly). They were awesome to us and it was more fun than the live performances as far as I was concerned. Q: Did you play any of the local teen clubs? If so, which ones? Were there many? I don't recall any of these, personally. Q: How far was the band's "touring" territory? We played from Eugene, OR to Woodland, WA and several points in between. 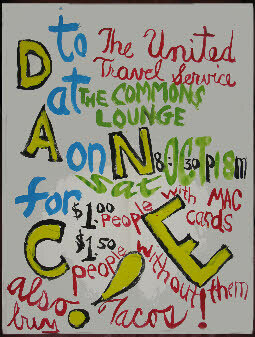 Q: Did The United Travel Service participate in any battle of the bands? If so, what other bands do you recall playing against? How well did the band typically fare? I think we may have played in a couple of these, but really can't recall any specifics. You know after 40 years the mind slips a bit. There is a fine line between factual memory and nostalgic creativity. Q: Did The United Travel Service have a manager? If so, how did you hook up with him? How active was he in promoting the band? We managed ourselves entirely. In fact, this was one reason (perhaps) we never really made any big moves with our recordings or touring. We had no money as we were all starving students. Had we had some money behind us, I think we could have made a reasonably good sized splash, even on the national scene. Q: How popular locally did The United Travel Service become? At one point, Wind and Stone was #3 on the KFLY charts in Portland. I think we were reasonably well known at the University but beyond that, I wouldn't really have a feeling about it. 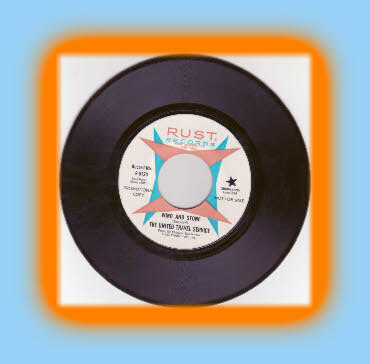 Q: What were the circumstances leading to the opportunity to record the first Ridon 45? Between Ben and Dale, they had the connection with Rick Keefer and we were one of his first groups. Rick basically gave us unlimited time in the recording studio for no payment. We couldn't have paid anything to speak of so it was a terrific deal for every one concerned. This started in Ken Bass's basement, I believe, but they opened their first real studio in Vancouver in '68 or '69. We played back up for another band they recorded but they had great faith in our sound and gave us a lot. Q: Where did The United Travel Service record? What do you remember about the recording session(s)? See last question. With the first recording of Wind and Stone and Drummer of Your Mind it is my recollection that it was just Ben, Dale and myself. I believe Rick or Ken actually laid the bass, but it might have been Ben just laying a separate track. I thought it was all done with the Vox amp. It was very exciting for me but being the least experienced musician I think I stressed out about it more than the others. When we recorded Gypsy Eyes (still my favorite) and Echo of You, we were throwing in some gimmicks as Laurie Records wanted to appeal to the younger set. On Gypsy Eyes, I remember laying a track with Dale drumming on the 12-string. Gypsy Eyes was an incredible piece of work. On the Echo of You, we used a Leslie speaker for the 12-string, giving off a very unique sound. We also used a metronome, and in the middle, I rushed into the room with stuffed animals playing Brahms, Bach and Tchaikovsky tunes. We used a chain across a piano and used a cello bow over the 12-string toward the end to fill out the sound. I loved the creativity of the recording studio. Q: Did The United Travel Service write many original songs? Who was the band's primary songwriter? Ben Hoff wrote the lion's share of our original songs and did the lead vocals on all of them. As I said, we were 40/60 in original vs cover material. Dale penned a few and I penned a few but none were recorded. Q: There are a couple of unreleased United Travel Service songs ('Slightest Possibility' and 'Snow'). Where were they recorded? Why were they never pressed to 45s? They were recorded with Ridon (Rick Keefer). My memory has it this way. The first release (Wind and Stone) was national but they did not print a lot of records and so when folks looked to buy them they couldn't find them. So the record hit the charts and quickly fell. Because the first release was less than a hit because of this, they were very reluctant on the second release. We mutually voided the contract with Laurie Records as a result and Slightes Possibility and Snow were left on the table. Q: Did the band make any local TV appearances? Does any home movie film footage exist of the band? Q: What year and why did the band break up? For me the band broke up when I was commissioned into the Air Force and went to Active Duty in July of 1969. My memory (probably the nostalgic one) thinks that we had a chance to play the Fillmore in September. That would have been my dream come true. Going active in July put the kabosh on that idea and it never came about. I don't really have a feeling to what extent the band played the year I left and Dale and I have never really talked about it. Q: Did you join or form any bands after The United Travel Service? I formed a company band with my employer in 1983 and we played for a number of years at company picnics and other company events. We played some Little League Adult events and the like as well. Q: Please tell me about your career today. How often, and where, do you perform (if at all)? If not, what keeps you busy? Today I work for Honeywell Aerospace as an instructor in Process Control and Lean Manufacturing. I haven't played in several years. I always hated the old Hoyer and fulfilled a life's dream when I purchased a Rickenbacker 12-string which I used for most of the company band years. It's a dream to play and I really want to get back into it . . . probably as I retire this year there will be more time. I travel 75% of the time now and it just hasn't been a priority. Q: How do you best summarize your experiences with The United Travel Service? Some of the best years of my life for sure. I loved every minute of it and the memories will be forever. We played at the Air Force Base in Crescent City California one year . . . stayed at the Trees Motel owned by one of the airmen's parents. They didn't want us to have to sleep in sleeping bags in the forest. All slept in the same room and woke up to a NASA space launch and huge breakfast at the hotel. There are other events just as memorable. We played together at a re-union some years ago for Ben's 50th birthday. It would be a kick to get ourselves together one more time. Who knows if that will happen but I'm ready for it. I don't really have any photos or memorabilia. It is one of my great misgivings. A couple of the photo's I have seen I can't even remember being taken. It is fun to see me at that age though. A long time has past. It was fun. Ask me anything else you like . . . it has been rather enjoyable to think about it some again. My interest in music began with the birth of rock & roll back in the mid-Fifties. I remember lying on the floor in front of my parents’ hi-fi, ear to the speaker, listening to rock as loud as they would allow me to. When I was about ten, they signed me up for accordion lessons. I don’t recall the instructor’s name, but it was some guy in downtown Portland. IN JUNE OF 1958 I PLAYED AT AN ACCORDION FESTIVAL AT LEWIS & CLARK COLLEGE WITH ACCORDIONIST CHARLES MAGNANTE DOING THE JUDGING. ON SUNDAY, JUNE 15, I PLAYED WITH TWO DIFFERENT GROUPS. IN THE FIRST, THE YANKEYS, SIX OF US PLAYED THE BATTLE HYMN OF THE REPUBLIC AND WON THIRD PLACE. THE OTHER GROUP, THE PORTLAND ACCORDION BAND, PLAYED MALAGUENA AND ALSO TOOK THIRD PLACE. As time went on I lost interest in playing the accordion (there didn’t seem to be any rock groups with accordion players) so I took up piano. A friend from my neighborhood got a snare drum and cymbal and we started a two-piece band. We must have driven my parents nuts. I only wish I had some tapes of our crude interpretation of rock & Roll. Maybe it’s better I don’t! There was a piano in the gym at the high school I attended, and a friend and I would go down and play from time to time. One song I remember is What’d I Say by Jerry Lee Lewis – I plunked on the piano and my friend sang. We didn’t sound too bad! The upright piano in my parents’ living room wasn’t something you could pack up and haul to gigs with a band, so my interest shifted to six-string guitar. In the fall of 1963 I entered Portland State, and by then I had acquired a Harmony six-string acoustic, which I still have to this day. I bought a “How To Play Guitar” book and started learning chords. At that point, learning to play by reading music was not an option I cared for since I had grown to hate the discipline of reading music while learning accordion. So I simply learned to play by ear. It wasn’t long before I developed a love for bass, so in December of 1963 I bought the only bass I could afford – a Harmony H22 hollow body. I think I paid $80 for it. By the summer of 1964 I was in my first rock group, The Targets (we soon changed our name to The Ascotts). Meanwhile I had begun what turned out to be a 35-year career with Nationwide Insurance, and since our group was new, we offered to play at the company picnic free of charge in August 1964. I didn’t even have an amplifier/speaker cabinet, so my girlfriend’s cousin (who was our rhythm guitar player) offered to share his. He had just bought a new Silvertone from Sears. It’s really amazing we didn’t blow it up because we both played pretty loud. A neighbor of mine was an electronics whiz and offered to build me a bass amp (I think this project cost around $50). I built my own speaker cabinet and got one JBL D140F bass speaker and passive radiator. I couldn’t afford two speakers. Since my neighbor’s last name was Coy, I got some stick-on letters and labeled the amp and speaker cabinet “COY”. People would come up to me at gigs and tell me they’d never heard of that brand. Indeed! The Ascotts played a lot of sock hops at local high schools in Portland in 1964-65. We wore green blazers and – what else – ascots (worse than a necktie, but at the time we thought we looked pretty cool.) We also bought a 1947 Cadillac hearse from a mortuary in Moses Lake, WA and used it to transport ourselves and our gear to our gigs. I remember coming home late one night from a dance. We missed our turn so we took a short cut…through a cemetery. We got a few strange looks as we came out the other side! Some of the band members wanted to do nightclubs but John Morton (rhythm guitar) and I just weren’t ready for that, so we left the group. The next group I played with was the Redondos. This was more of a surfin’ group and marked my introduction to singer/songwriter/lead guitar player Ben Hoff and John Carter (12-string). The first gig I did with them was a private party in July 1965 on Sylvan Hill west of Portland. I still have tapes from that party. I played with The Redondos through the end of 1965 and I think the reason the group broke up was because John went into the army in January 1966. In late 1965 I joined up with a group called The In Crowd which reunited me with Gerry Durham, drummer from the Redondos. I think the name of our group is the reason we landed a regular job at a new nightclub in Portland with the same name. Our first gig was a Halloween party in October 1965, and we also played sock hops at the local high schools and one dance at Portland State College in March 1966. The last time we played as a group was at The In crowd in May 1966. I don’t recall why the group broke up. Moving on, I replied to an ad placed in The Oregonian by a group looking for a bass player. I auditioned and got the position with a snazzy group called The Classmen. This was my introduction to drummer Dale Sweetland. We only played together for two months as our lead guitar player Mike Smoke entered the army in June 1966. My most memorable gig with The Classmen was competing in the first Battle of the Bands in Portland, held at the Memorial Coliseum. We ended up taking – you guessed it –third place. We had matching outfits and choreographed steps we did while playing. 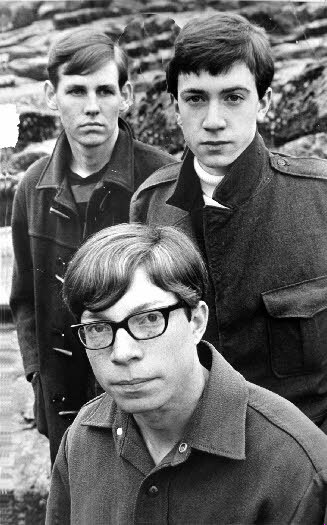 This experience landed us a gig at a dance in June 1966 in Corvallis, which was our last one together. In August 1966 I was drafted into the army, but I kept playing. My first Army group was formed at Ft. Sam Houston, Texas, and we called ourselves Leon Snarf And The Boys Minus One Buffalo Fish. I had heard that name somewhere along the way and since no one objected, we adopted it. Kind of a strange name for a folk singing group. We played a talent show at the base and took –yep, you guessed it again – third place! We also toured as a group through Brooke Army Medical Center in San Antonio to play for the troops in the hospital there. I used an old standup bass that i dragged through the hospital…what a monster. I had never played one before, but it worked out pretty well. We even received a letter of commendation…someone must have felt sorry for us! When I ended up at my final duty station at Ft. Lewis, WA, another group was formed. I played bass and we had a drummer, a guitar player and a singer. Our name? Vulture And The Body Lies. I have no idea where that came from. We played a talent show in November 1967 at The Chinook Club at Ft. Lewis, and at a “company” picnic in February 1968. I was honorably discharged from the army in August 1968. Around the time I entered the army I became part of the group I’m most fond of – United Travel Service. It reunited me with two former fellow group members, Ben Hoff and Dale Sweetland. Our rhythm guitar player was John Reeves on 12-string. I believe the first time I played with them was in a Battle of the Bands at the Masonic Temple in Portland. I have no record or recollection of how we did. One thing I do remember is that this was the first time I heard a group play using Sunn equipment. It simply shook the house. I knew I had to have a Sunn amp and cabinet. I played with UTS through October 1969. We cut several records, which did quite well locally. We were all in college and I guess we epitomized the typical starving musicians stereotype. I still have tapes of much of our music from that time frame. UTS was quite a special band. I don’t think any of us realized this at the time. Ben was (and is) a very gifted songwriter and great guitar player. John was great on 12-string – it really brought a new dimension to a rock group as I think it added more depth to the music versus a six-string. And dale – just an incredible drummer. We all loved the music Ben wrote, and after one or two takes, we had it well blended into some really great arrangments. I think if we’d had a manager/promoter back then we could easily have gone national. I don’t recall why the group broke up –possibly John going into the air force in July 1969. Recently, after a nearly forty-year musical hiatus, I got the urge to see if there was anything on the Internet on UTS, and was I ever surprised to find us on the web site of a fellow from England. I corresponded with him and discovered that UTS has a following in Europe. I then located ben’s address and wrote to him. From his reply I got the addresses of the other band members, and now we’re all back in touch with each other. It’s great! I’m certain we’ll have a reunion of UTS later this year and hopefully we can do something we should have done all those long years ago…make an album. P.S. When I retired from Nationwide in 2001, my wife started begging me to start playing guitar again. Seven years later her wish is coming true. Last night I plugged my newly acquired vintage Harmony bass guitar into a borrowed amp and tentatively began to play while she stood nearby grinning from ear to ear. I now have a Sunn Coliseum 300 bass amp, and will soon have Sunn speaker cabinets with JBL D140F bass speakers. I’m baaaaaack! Of the four of us musicians, Dale Sweetland was the most technically knowledgeable, due at least in part to being the son of Elliot Sweetland, all-around musician and author of music-instruction books for various instruments, published by Belwin Publishing. Dale was one of the three late-1960s drummers who impressed me the most, the other two being Keith Moon of The Who and Ginger Baker of Cream. Keith Moon had an uncountable number of toms, snares, and cymbals; Ginger Baker had two bass drums. Dale just had the typical minimal set (none of us UTS college boys invested much money in instruments), but he got more out of his equipment than any drummer I'd seen. He's still playing, in Las Vegas. John Reeves impressed me when I first met him as a sort of study in contrasts: He looked like an open-faced country boy who could maybe by appearances play a few simple folk tunes on the acoustic-electric twelve-string guitar he carried -- but who I quickly learned knew the latest songs and bands from the Fillmore, and could get the wildest feedback loops and other effects from that innocent-looking folk guitar. Like Dale with his drums, John could coax more sound from his instrument than seemed possible. John's use of twelve-string guitar for rock-and-roll was highly unusual for its time. Jim (later to be Roger) McGuinn of the Byrds -- a group with whom we were sometimes compared -- used a twelve-string for lead, as did George Harrison on a couple of Beatles songs; but for the most part, twelve-strings were played by folk, not rock, musicians. As for John's playing, he always did the right thing in the right way at the right time. One can't do better than that. The effect -- as in all the best guitar playing -- was simple; the skill -- as in all the best guitar playing -- was not. Ray Doern was so reserved and self-effacing that he sometimes seemed to not be there. But if for some reason he stopped playing, everything instantly sounded crummy. Ray's bass work was like his personality -- solid, no frills, the way bass, at least in my opinion, ought to be played. (When I later started learning bass, I patterned my playing after Ray's and that of Paul McCartney -- who was, it seemed to me, a very underestimated bass player, highly esteemed though he was as a Beatle. ) When I hear showoff bass players trying to be heard above everyone else in the band -- increasingly typical -­I appreciate all the better the foundation-of-the-sound playing of Ray Doern. As for myself: I started guitar in middle school, after trying clarinet -- and enduring sarcastic remarks about me as "Benny Goodman, King of Swing." I pestered my parents into buying me a guitar; they bought a small Mexican guitar cheaper than the cheap case they bought for it, obviously figuring that I'd mess around on it for a couple of weeks, get discouraged, and quit. They figured wrong. After I'd tortured their ears for a while trying to learn on my own, they hired a first-rate teacher for me, former big band guitarist Eddie Covey. I've always been a wanna-be harpsichordist, and my guitar playing tends to come out sounding, so I'm often told, like a harpsichord. Although I used fuzz and wah-wah in several UTS songs (not on record), and was even over-praised by a band admirer as "Eric Clapton, Junior," I've always preferred a clear, ringing sound.From rock I went to classical. I now own a six-string classical and ten-string "harp guitar" (both custom made), a modified Godin fretless long-scale bass guitar, a limited-edition acoustic-electric, a modified SoloEtte electric classical, and (my latest project) a Chinese imitation Stratocaster® that I and four guitar-and-circuit-builders have transformed into my idea of what an electric guitar ought to be. (I'd made my own solid-body electric in high school, and have never stopped hot-rodding guitars, cars, and whatever else I can get my hands on. ) Some people have suggested that I patent my guitar construction/wiring innovations and market my neo-Strat®, but they're a step or two ahead of me. In the early 1980s, after writing a surprise (to me) hit book, The Tao of Pooh, I got sidetracked from writing and playing music into writing book manuscripts -- and now screenplays. But I've lately begun to question the wisdom of that career choice (as explained on benjaminhoffauthor.com). Since high school, song-writing has always been the easiest thing in the world for me -- I can write a song in half-an-hour or so, although lyrics can take longer. Guess which profession I should have gone into. I've been having a recurring dream, late at night: We United Travel Service members are on stage in a large, crowded music hall. I step up to the microphone, playing my old white solid-body. The spotlight swings toward me, the faces of the audience turn in my direction, and I start to sing. I've ridden horses at full gallop. I've driven powerful cars very fast. I've climbed mountains, hot-dog skateboarded, mountain-biked in a make-it-or-die run down a steep, rock-paved logging road... But I've never experienced as much of an adrenaline rush as I did playing lead guitar and singing. And for a few years I had the great opportunity and pleasure to do so, in UnitedTravel Service. I'll always be grateful for that. "Drummer of Your Mind" was, I believe, the first recording we made at Rick Keefer's/Ken Bass's home studio in Beaverton, Oregon. The words were inspired by Thoreau's famous "different drummer" quotation; the tune was inspired by clavichord and harpsichord minuets. Dale double-tracked the drum part. He's always been bothered by the fact that, due to the studio headphones he had to use, he couldn't perfectly synch the second track he was playing to the first, which he couldn't adequately hear. But I kind of like the effect of the overlap, which reminds me of massed drums in a marching band. Next to record -- in the same one-day session, as I remember -- was "Wind and Stone" (title by Dale, as I couldn't come up with a good one) . John, I remember, was having trouble at first getting his usual hair-curling feedback effects from his guitar, but after a while the stubborn instrument started to properly misbehave. People have commented on my "raga-like" solo. It was actually inspired, as was the rest of the song, by bagpipe music (I loved massed pipes and drums, and still do). "Snow" was, I believe, the next song we recorded, followed by "The Slightest Possibility" -- although it may have been the other way around. Another one-day session, I think. The occasional shimmering sssss sound was accidental feedback off Dale's cymbal, which Rick decided to leave in. For an example of what I said about Ray Doern's playing: Listen to “Snow” and imagine it without his bass work. Drags, doesn't it? Rick or Dale (the latter, I think) brought a couple of trumpet players to the session, to add something to the song. Dale wrote out their parts, they and we ran through the song a couple of times, then we recorded it in (I think) one take. One take instrumentally, that is; the vocals were always overdubbed. "Snow" is the only one of our/my songs that I attempted (sort of) to market. I sent a demo tape of our recording to the vocal group The Association. About a year later, I got it back in the mail -- no letter, no note. "The Slightest Possibility" was recorded in the bouncy, nutty spirit of the song itself. Ken's basement studio had flooded the night before, and he was still mopping up the water when we got there. We stood on our toolboxes, off the wet floor, to keep from being electrocuted as we danced, played, and sang through the song -- me on lead vocal, John and Dale on backup. At one point, Ken was nearly fatally electrocuted as he reached into the higher-than-house-current innards of the studio circuits to fix something. That sobered us up for a while. I got the idea for "ytilibissoP tsethgilS ehtT" ("The Slightest Possibility"backwards) when Rick rewound "The Slightest Possibility" on the studio machine. As it passed over the heads in reverse, I thought: It sounds pretty good that way. I later asked Rick to make me a demo of the song on 1/4" (home-recorder) tape. I then flipped the tape over on my machine and recorded the running-backwards result on another machine. I think the lyrics-in-reverse sound a bit like Russian. "Like Me" has the strangest history of the songs we recorded for Rick Keefer -- that is, it has no history at all, as far as any of us know. Sometime after Dale put our other studio recordings on the Internet, Ray sent us each a CD he'd just had made of our studio-recorded songs. Among the songs was "Like Me." I was moving around my living room while the CD played. When "Like Me" came on, I stopped, mesmerized. I suddenly remembered writing it. But I didn't remember recording it. I played "Like Me" again and again. "I really like that song!" I declared to the living-room wall. I then phoned Ray. "I just heard 'Like Me,' ” I told him. "I don't have a copy of it. Where'd you get one?" "A long time ago," Ray replied, "I asked Rick to make me a demo tape of our songs. After I'd played it for a while, I put it away and forgot all about it. But a little while ago, I got out my old reel-to-reel and discovered the tape –and that song." "Do you remember us recording it?" I asked. "No," he said, "not at all." I talked to Dale. He didn't remember recording it. He talked to John. He didn't remember recording it. My conclusion: Since the recording has two trumpets on it, "Like Me" was probably recorded on the same day as "Snow." I would guess -- but it's just a guess -- that we did it in one try for the instruments, one try for the vocal, and then quickly went on to the other songs. For various reasons, it sounds to me like an “idea” recording–a musical sketch to be filled in later, with a guitar break and so on. Why I don't have a copy is a mystery. Another mystery: Here and there in the recording can be heard what sounds to me like a viola playing (especially audible after the words "It's not a bad way to be"). Where, I wonder, did we get a viola? Who played it? "Gypsy Eyes" is the only studio recording I have a date for: March 16, 1968. It and "Echo of You" were recorded by Rick at Ripcord Studios in Vancouver, Washington. "Gypsy Eyes" is my favorite of our songs on record. I wrote it for a girl I saw at a downtown Portland bus stop. It's one of the first, or possibly the first, flamenco-rock songs on record. (The bus-stop girl was a flamenco-rock sort of girl.) It was released in the Pacific Northwest as the "B" side of "Echo of You," as Jimi Hendrix had released a song titled "Gypsy Eyes" and Rick thought that to put ours on the "A" side would appear to be capitalizing on the Hendrix reputation. No offense to Jimi Hendrix, but we should have made our "Gypsy Eyes" the "A" side. Ray was gone by then, so Jim Roberts played bass on "Gypsy Eyes" -- a great bass part.I overdubbed an improvised flamenco-like solo at the end, while Dale drummed on John's twelve-string as John chorded with his left hand. All three of us were supposed to start the overdubbed part at the same time, but Dale missed his cue somehow and started his dum-diddle-um bit four measures late. Sitting on a long-legged stool by the mixing board, listening to the recording-so-far through headphones, out of sight of the other two, I started my solo on the downbeat. No backup from Dale and John. I glanced at Rick. He shrugged. I continued up the neck, then started down. Just then Dale's pounding-pounding-pounding on the twelve-string began. From that point on, although I could feel my fingers running over the frets, and was aware of rocking back and forth on the stool, I was playing in another world. When the tape stopped, Dale and John opened the control-room door and walked in, looking dazed. "Wow!" said Dale. When we heard the playback, we all agreed that he'd come in at the perfect time. "Echo of You" was the last studio recording we made. I played bass; John played rhythm through a rotating Leslie speaker; Jim Roberts played backup rhythm. We then added an instrumental overdub, at the end of which I played my electric bass with a cello bow while Dale played chords on the studio grand piano, over the strings of which Rick had placed a chain for a clang, clang, clang sound. Before the final verse of the song is a brief interlude, during which three music boxes play simultaneously. John's job on the overdubbed track was to start the music boxes playing -- well away from the microphone -- then run to the mike, hold up the music boxes for the interlude, then run back. I have a mental photograph of him, clutching two music boxes and a large music-box teddy bear, crouching behind a sound baffle, waiting for his cue. "Crystal Land" was written under the influence of Tim Buckley. ("I will sing silver songs of your smile" -- very Tim Buckley, that.) If I were to perform the song today, I would rewrite the lyrics. I like the guitar work, unpolished though it was when we recorded it -- it has a strangely medieval sound. "Plastic Paradise" was written under the influence of Malvina Reynolds and Pete Seeger. ("I heard once long ago," it says, "of things called 'grass' and 'trees.' But where did they go? What do they mean to me?") Like "Wind and Stone," "Plastic Paradise" is what was then called a "protest" song. Could the "protest singers" of the '60s have imagined then just how bad things were going to get? A sobering thought. Of the ten steady and stable bands I have played in, the first four (1963 The Cobras, 1964 The Valiants, 1965 Redondas, 1969 The United Travel Service) are the best. The common thread is the musical corroboration with Ben Hoff. I relive this epoch in my life as often as my memory permits. The story with the United Travel Service can be told in two very different ways: the first story would have me live the last forty years (from 1968 to 2008) just missing the success yet living the energy and being part of the power that was generated. To me this band has always been Ben’s band and during the course of the past forty years, I unconsciously took direction and meaning from Ben. Story number two, the story I recently just learned, changes everything. Story number two is that John Reeves started the whole thing. You have all been able to read his story, so I will take the liberty to tell you the story I lived. It’s important for me to start where my music found its beginning. I was always musical and rhythmical. I can remember listening to all forms of music on the radio before I could reach the knobs and playing music on anything that could make music. I tried everything from tapping on the leg of a chair to pressing the keys of a Baby Grand Piano. My mother was a great piano player and I can remember watching her hands float over the ivory keys creating anything from one note using one gently placed finger to as many notes as she could reach with all ten of her fingers coming down at once. I also discovered that I could sit under the piano and truly feel the rhythmic changes and the huge vibrations so much so that I sometimes believe I could move the floor as I listened. During this time of exploration my older brother (by four years) started piano lessons. My mother was classically trained and my brother was getting lessons in popular music. This exposed me to the distinguishing characteristic of multiple time signatures my mother used and the power and gravity of my brothers’ 2/4 and 4/4 time that he seemed to end each practice session with. In those sessions, I remember him improvising chords that didn’t sound like those my mom played. dinner. I can still remember so clearly. At the Three Star Restaurant in the far corner of a very large dinning room with a dance floor, I saw my first band. I knew that was so cool. My mind left the dinner table for the whole night and several times I even walked over to the band to watch them work. It was amazing to see, hear and feel the pulsation of four men playing four different instruments. I can remember being able to focus on one man at a time. I remember being able to move from one instrument to another sound and back again when finally I let them all come together to form one perfect sound with four parts. I can’t remember any singing or a singer so all I can say is this was my introduction to the musician or the “sideman”. From that moment, I wanted the same connection with a band. Since my brother was the piano student, he more or less controlled the time at the piano. So, my interest took me to a different direction. I went with my mom to visit our neighbor. As they talked I found a way to entertain myself with a ukulele I had found in the corner of the room. Before the morning was over she gave me the ukulele and a book which taught me to play. Another musical milestone occurred at Christmas during my fourth grade year: my father gave me a record player that played 33s and 45s. This would ignite a new freedom of major importance. I was able to collect the music that left me speechless and more than anything else I was able to listen to music whenever I wanted to. As my record collection grew, my social life changed. My latest record and I were invited to the house of the girl across the street. She was my age and I still think she is one of the prettiest girls I’ve ever known. I spent a lot of time with her listening to our records. On one of these days we were sitting on the floor together when she said, “all of your records have one thing in common, they all have a guitar playing a major part. Why don’t you get one?” (A guitar,) I said as she nodded. I don’t know if I did it for her or for me, it didn’t matter I went out to purchase my first guitar. I got a $20 Sears Spanish Acoustic. It came with a small instruction book I used to helped me tune it to our piano and to play a few chords. Duane had the biggest guitar sound I had ever heard. He knew how to achieve a warm, luminescent, vibrant tone I had not heard from any other guitar player. I was lucky enough to hear him at a live concert only one time and he had the same richness in person as he produced on the records. I have every record he has made and with the exception of two or three songs I could listen to him all day. I learned to play, as best I could, every song he made. In the seventh grade I sang in a talent show but my skill level at guitar wasn’t ready to play and sing at the same time. I asked a friend, Phil, who was already a very good player to help me out. I sang the Rick Nelson song “There’ll never be anyone else but you” and I nailed it. Phil played terrifically and as a consequence he introduced me to the ever so useful C Am F G chord progression. I was trapped. I think I wore that out for the next two years. A few months later Phil had a talent show of his own and he asked me to join him. I still have the program. We were called “John and Phil”. We played once in a while for the next few years. Then I got a phone call. The call came from Ben Hoff. He said “I got your phone number from my cousin Phil. Phil said you like to play guitar. Would you like to get together?” I told Ben that I didn’t know any songs but I liked playing chords. He said that was good because I know a lot of songs and need some rhythm. Thus began my intro to Surf music. Ben was so skilled and polished that I fell right into the grove he was building. The first time we played together felt like we had been together for years. I had never experienced so much fun. That connection I saw, felt and heard so long ago at the Three Star Restaurant was no longer a dream. I knew the feeling and I was hooked. Two weeks later Ben and I were in our first band (The Cobras) and by the end of that week we played our first job. And earned real money! of a band. From that moment I learned to listen to the base player. He will make you believe in the song. During this time, ’63 through ’65, I finished high school and went on to Mt. Angel College. In December ’65, I was drafted into the Army and that lasted through Dec ’68. It was in this time period the United Travel Service (UTS) formed. I continued to write to both Ben and Ray sharing all of our related music experiences. By this time Ray was also in the Army (Ft. Louis) and playing bass in a folk band. Ben was at the University of Oregon getting ready to meet John and Dale and I had secured a place with Special Services playing guitar in a touring show. I did three or four road shows during the three years I was in the Army. They were very good and well-produced package shows that I was proud to be part of. It was an experience that became useful later in my music career. When the United Travel Service (UTS) released “Wind and Stone” Ben sent me a box full of records. I was in El Paso, Texas (Ft. Bliss) keeping the Hawk Missile operational. I took the records around to the radio stations to get airplay. I recall talking to a station manager about our record he said he remembered seeing it but hadn’t listened to it. I asked why. He pulled open a drawer that was filled with records and said we just received these and will try to listen to them. He asked me again for the name of the band. I said the United Travel Service. He said, “oh that’ll be at the back. We file them alphabetically. We might not have the time to get to the end of the stack.” I eventually talked him into listening and he liked what he heard. He had a few reasons why he wouldn’t play the record. One was that I had to show that the record is on a chart. Luck would be with me as Ben had included a radio station chart from Portland that had it in the top ten. Upon seeing the chart the manager agreed to started playing it. Several stations in the area put the song on their play list and I was also able to get some of my friends to call in and request it. This was easy because they all liked the song. I even made a day trip to Albuquerque, New Mexico. I visited some stations and left copies. They all said they would play it. I have no way of knowing if they did. home from school for the holiday. When my time in the service came to an end I went right back to Mt. Angel College to pick up where I had left off. In March of ’69, I went to what I believe was the last recording session for the UTS. This was the first time I met John Reeves. I can only remember little bits of the evening. The building was new and didn’t have any steps to the front door. The control room was narrow. Ben sat on a high stool in the corner of the control room. Dale spent most of the night at a set of drums elevated on a platform behind a baffle. John sat in the middle of the studio with his twelve-string guitar. I can’t remember a plan that would involve Ben or John. I talked a lot with Richard Keifer, the producer, as he kept playing back parts of the song and working on a sound check with Dale. I don’t remember how long I stayed or when I left or whether we all left at the same time. I’m sure that we stayed for several hours and the time flew by. About 15 years ago in 1992 I did a recording session in that same studio. Lets return to the magnetic Basement Tapes. The day started without the mystery and magic that I began to feel as the day progressed. It was a simple summer morning about 10:00 AM when we began to gather at Ben’s “old” apartment in the basement of NW Portland on July 21, 1969. I had no way of knowing that by the time the heat would settle and the dust would linger, the reward from that day would never end. And yes, I still feel it pulling on me today. The energy I got was from watching Ben, Dale and Ray play with a collective passion that I had never seen, felt or lived before or since. I know I felt the day because I lived it but I have wondered if I could have believed it except for one thing: I got it on tape, nearly the whole day. There is a lot more on the tape than just the eight songs when including the out takes and bloopers. You can hear through the jokes and candid moments where the tension was broken how much we trusted each other. We only worked on eight songs each from start to finish that day. We lasted until about 3:00 PM when Ben, Ray and Dale crashed and I, wanting to be alone, went up on the roof of the three-story house. Rex, Ben’s landlord joined me and had to talk about the moonwalk. And yes, that’s how I can remember the date. Thanks Rex, wherever you are. I have listened over and over to those recordings and I don’t know how to say what I feel or what to say except I simply like to listen to what happened and I’m glad I was there and lived with it. We played a couple of jobs that summer and several more times at Mt. Angel College. The last one at Mt. Angel is the most memorable. We had a light show by “Toad Hill Projection”. The Commons area was a semi-circle with a dome ceiling that he was able to project and cover almost the entire room. I remember at the close of the night we broke down one at a time. I was first to put my guitar away and moved my amp to the back of the room as Ben, Ray and Dale kept playing. Next I helped Ben take his amp and effects out to the car. Ben and I helped Ray move out. That left Dale playing a drum solo. The three of us came back for a piece of Dale’s kit and left him with the snare and Hi-Hat. Last we went in and I got his stool, Ray picked up the hi-hat while Ben grabbed the snare and walked Dale to the door playing and not missing a beat all the way to the car. Ben, Ray and Dale got into the car and drove away as I stood there waving to them. I went back into the commons that was still half full of students with that look of not sure what just really happened. As a band we were always able to do spontaneous things on and off the stage that kept the energy alive and always changing. I have so many stories I could tell. Ray said that I should write a book. Well, we’ll leave that to Ben. He’s the author. That takes us through the fall of ’69 and the winter of ’70 until the point where Dale would find another band to work with. In September, I started my last year of college. In January of 1971, with positive advice from Jerry Garcia, I purchased my first Pedal Steel Guitar. That event changed my whole life. I became a full time student of the steel guitar. From that first day and every day since I have learned something new on that instrument. Ben and I have always stayed in touch. We never lived more than a few miles away from each other. With Ray it’s been a little different. We stayed in touch until October 1972. We had dinner at my house and at the time my head was really into the steel. He left that night and we were not to see each other for 35 years. As for Dale, he went on the road. Then, in 1997 I got a call to sub in a band for someone that was sick. I played one or maybe two weekends and it’s still hard to believe, but the drummer was Dale. What a night that was. There is no one who can drum like Dale. He is the most musical drummer I have ever worked with and to me that quality makes him the best, cleanest, solid musician I know. And, he is fun. I could do some name dropping right now and list some of the drummers I have been lucky enough to share the stage with but the point would be missed and lost in the naming. So it should be said that Dale is the “Sweetest” drumming you can buy. The guys talked about their instruments so I will follow suit. With the UTS in the “Basement Tapes” I used a Fender Electric 12 string Strat. which I sold a few years ago. I still own the 1962 Gibson ES 330 TD that I bought new when Ben and I started playing together. At that time I was using a Fender Vibrasonic amp. I also just sold that a few years back. I hadn’t used it for about fifteen years. In 1968 I bought new a Martin D-35 12 string which I still own and continue to play because it sounds so good. Can I say I love it? As well as the above listed I own two Emmons D-10 pedal steel guitars, one is MIDI controlled. I have a 1934 Rickenbacher Electro Fry Pan lap steel. An Oahu tone master lap steel and the Oahu amp that it came with in 1945. A really cool sound. I have a ten string Dobro custom made that I ordered in 1978. Last but not least I have a Fiddle that has been in my family for way more than 100 years. Yes it is a good one. For power I use a Peavey Nashville 400 amp. I bought that in 1984 and it’s never been in the shop. I use it a lot, too. My signal processor is a Korg A-3 and for processing my MIDI sounds, I use a Roland JV-880 and a Roland S-550 sampler. My recording equipment has grown from a simple reel to reel deck that I still have to a 32 track Digital workstation and lots of other equipment. My studio is computer based with Sound Forge software. Del Reeves Red Simpson and the Hagger Brothers. I preformed at the International Steel Guitar Convention, and also worked as a representative player at NAMM Convention in Los Angles. I have been a part of an opening act for a number of shows that include Charley Pride, Gretchen Wilson, Randy Travis, and Carrie Underwood. I have had so much fun. Who can ask for anything more? Well, I can. I just want to spend a little more time with Ben, Ray, Dale and this time I don’t want to miss out on John Reeves. What a fun band we are.